For those in despair for the online shop orders on the way to Indonesia, I will share to you my experiences. 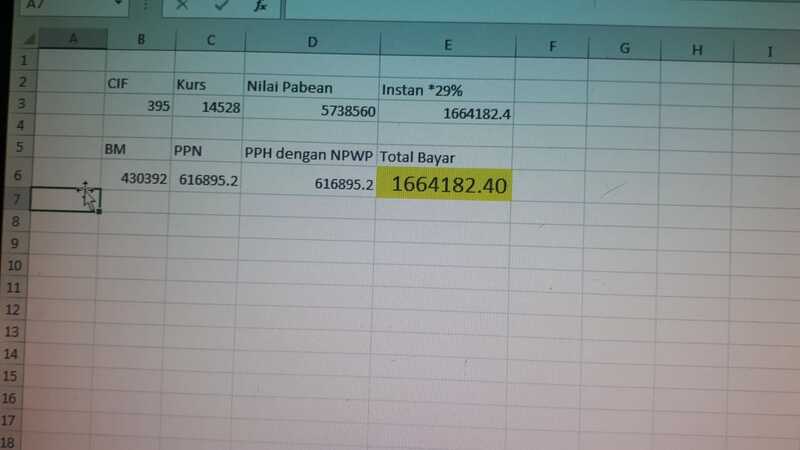 This will hopefully answer your google searches from " belanja online dari luar negeri ke Indonesia ", " pajak belanja online shop di luar negeri ke Indonesia ", " pajak masuk beli barang dari luar negeri ke Indonesia ", " duration online shopping to Indonesia "to " beli barang online di luar negeri kapan sampainya ". It's whether you're looking for awesome stuffs that are not available in the country or Indonesia doesn't give you good price, or simply because you're expats and need something that hard to find in Indonesia and nobody can hand carry those things for you some time soon... I dedicate this to you! These past months, I was crazy in love with a red lipstick pump shoes. I never like shopping in the store. Too much temptation! Ha! But, I didn't find any pairs here in Indo. So I thought, ok, not my luck. 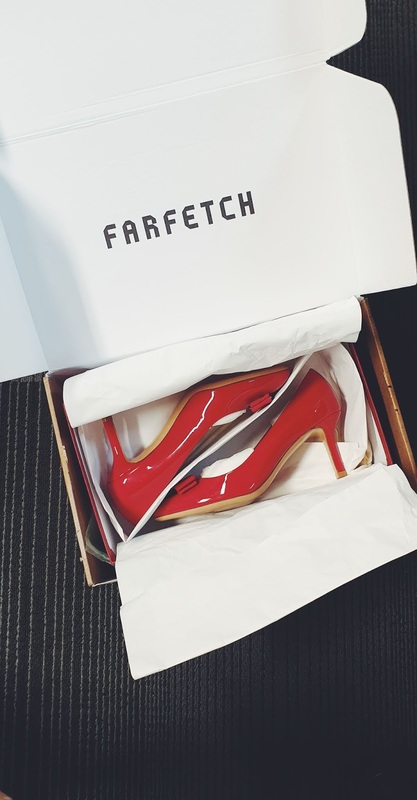 But then I found one pair in Farfetch.com, a UK-based e-commerce that sells many entries from worldwide designer stores. That pair in my size... there was only one left. So you can guess, all that jazz, panic and excited at the same time. Plus, it was in discount! Hooray! When I put it in cart, the delivery cost was flat to $23 using DHL. C'est superbe! This order was my first shopping online from abroad website since I used to lose my package once! I was a bit traumatized yet I felt like I need to give it a try for Farfetch.com. My bookdepository.com was sent through local postal service, which means in Indonesia, that would be by Pos Indonesia. My bookdepository order was never found. No barcode and nothing I could do to get it from the Pos Indonesia office. Plus, Pos Indonesia is never helpful, so I assume my hope for the book is dead. After 8 months missing, I decided to go to the biggest post office in Central Jakarta, based on my delivery address I gave to bookdepository.com. Sadly, it was sent away with regular post so there's no barcode. I was sent here and there in the post office, even going to their basement, passing their dark warehouse (even a guy who worked there sort of verbally harassed me) and no one could help me anyway. Back to 10 years ago, my sister sent me a box of new clothes I bought online. The order went to her house and she repackaged it and sent it to my house. It took 2 months! However, it didn't just arrive like that... even after TWO MONTHS. How it went was that my mom asked our regular postman how package from overseas would arrive to the country then to our house. Thankfully, the postman was a great guy, he asked the details of the package and he searched for it in the his office. He found it! Turned out, there's a fee we need to pay that made our package stayed in the post office! Funny, they didn't notify us if our package had arrived and there was certain amount we needed to pay. How the hell could we know? By the help of the postman, it was settled. So I was worried about this one. Thankfully, Farfetch will ship my shoes through DHL which has much nicer service and super updated tracking page. I felt relieved. But, there's another thing: the tax! In Farfetch case, it was told that duties have been included in the price which is only applicable to certain countries. Indonesia... of course, isn't included. Ok, here's the thing. If you buy online stores abroad to be delivered to Indonesia, there will be tax for you to pay. I googled some sources, if it's under $75 (seen from your invoice), there will be no tax. But above that amount, there will! The DHL service was fast and the tracking page is super cool. I ordered it on Tuesday, and it's already in Singapore by Friday morning, and Jakarta by noon. The courier service will notify you about the tax, if any, beforehand. You can pay the tax amount through DHL and DHL will forward the payment to the government. I received a text message regarding the duties with a link to do the payment online. Or you can pay by cash when the messenger come to you with your package. If you don't pay, DHL cannot hand you the package. Yet... what bothered me was.. how expensive the amount of tax. I don't know how to calculate the tax, but I paid 40% from the price amount of the product! For me, that's ridiculous. Even though you're not going to resell it and you just buy one pair, still... the tax is that expensive in Indonesia. 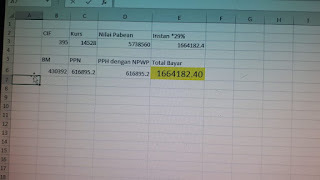 There are tax payer number and luxury product tax appear in the calculation. For simple way, it's multiplied by 29%. Based on her calculation, it was supposed to be 1,6 million something. I don't know what's going on. When I received the link to pay online, there were another items to pay, included in the total amount, such bank service, etc. I regret I didn't take a screenshot before I paid. Now as I've paid, the page is no longer accessible. ... I just paid to retrieve my heels! Right away! If you're looking for fashion brands to shop, try reebonz.com. Once I bought a handbag, it was ok. No other tax or additional cost. The downside was the shipping from Singapore takes longer, compared to DHL sending me my heels from Europe. Consider yourself lucky if there's someone who could hand carry your stuff. 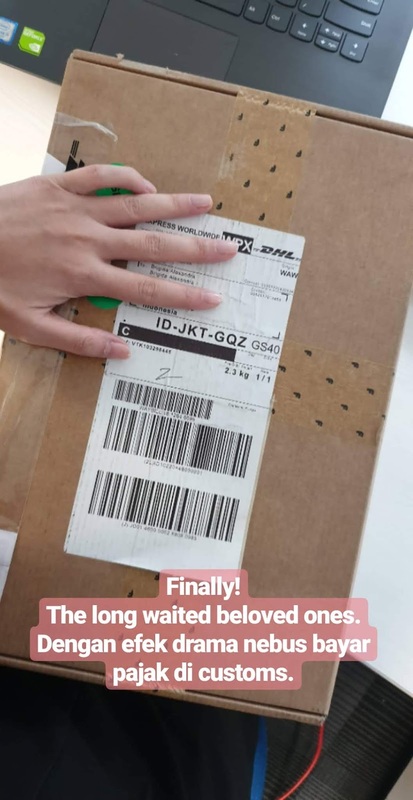 For example, you can order online and send to local address and your friend will bring it to you through their luggage. But I always try not to order something heavy and take lots of spaces. I don't want to be a burden. Or...... you can always looking those jastip people and personal shoppers! They are amazing! So yeah, that's my experience. Not gonna buy anything online from abroad unless it's so urgent. The government tries to protect the local brands buy setting the tax high for what we buy from overseas. However, I don't think it's the right way to do it. Some local brands here are expensive but low quality. Defending them like that would only make them think like we don't have enough choice but to keep buying low quality products and it makes them not to think of improvising. I know some good local products, some of them are owned by my friends. But maybe, in return, I would definitely more picky in buying local products now. Thanks, system and government! Another moral of the story: try international courier service like DHL and such.